Whether you’re planning a cross-country trip with your dog to visit family for the holidays or making a longer trip out of it to stop and do some camping with your dog, it’s normal to worry about how your pet will react, where you can go, and how much money you’ll have to spend. 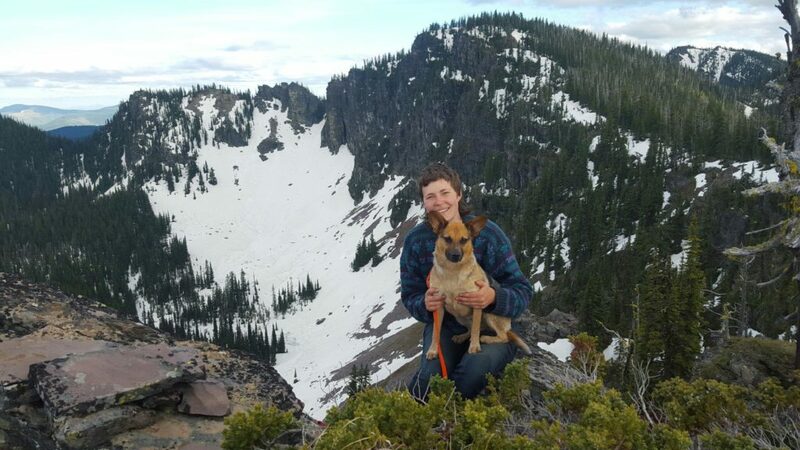 My partner Hannah and I traveled and lived in a Subaru Outback for 6 months exploring the country with our pup, Basil. In that time, we learned a lot about what worked—and what didn’t—when it comes to traveling with a dog. Here are my tips on creating a safe and memorable trip with your furry friend! Keep in mind, this was our experience—every dog is different and will need different training and attention. This might seem obvious, but make sure your dog is comfortable riding in the car on long trips. Drive a few hours to go on short adventures together and see how your pup reacts. Make a seat or area in the car that will be designated for your dog. 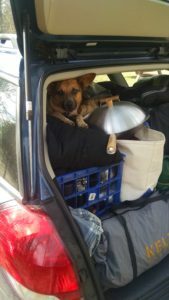 The space will be a home base and one of the only constants in your pup’s life on the road. One of the most important factors is knowing that your dog won’t bolt when you open a car door. There will be times when you’ll be stopped on the side of a highway or in the woods at night and you can’t have your dog rush out the open door. Before traveling, it’s a good idea to practice having your dog stay in the car until you tell them it’s OK to come out. Have water available at all times. It’s easy to forget and hard to ask your dog if they’re thirsty, so make things simple and just give them access to a water dish. Make sure to have good-quality water bottles, such as bpa-free Nalgene. Low-quality plastic bottles can leach chemicals into the water, which is particularly harmful to dogs. Make sure you stop regularly for your pup to exercise, which is a good reminder for you as well! Drastic changes in weather and climate—intense heat in a desert or freezing cold in mountains—can be hard on your pup. When we visited the Valley of Fire State Park in Nevada, we did not anticipate how much hotter it was for our dog than it was for us. We took Basil out for a short walk on a trail and she was overheated in less than a minute and simply laid down. Always think ahead and remember that if it feels extremely hot or cold to you, it might be dangerous for your dog. Wild animals—such as rattlesnakes, poisonous spiders, and grizzly bears—can also prove dangerous to your furry companion. Our dog Basil doesn’t know to avoid snakes (and sometimes doesn’t even see them) and will often eat spiders. It’s up to you to know if there are dangerous snakes or spiders around, as your dog won’t be able to tell the difference. For grizzly bears, attach several very loud bells securely to your dog’s collar as a preventative measure, not as surefire protection. There are no ways to completely prepare for crossing paths with a grizzly bear, so avoid hiking and camping in places where they are common whenever possible, for your sake as much as your pup’s. Does your dog need a crate to sleep? Can they sleep in a tent? Some dogs need a crate to feel comfortable to sleep. If you’re unsure if your pup will sleep in a tent comfortably, try camping in the backyard (or the living room!). Hannah and I brought a crate for our dog Basil, but only used it on our first night. We were camping in a tent in spring and it became much colder at night than we anticipated. Basil quickly left the crate and crawled under our blankets to be warm. Will they bark at every little sound? This is both for your dog’s sake and for other people camping nearby—if your pup is barking in the middle of the night, nobody is going to get any sleep. The biggest way that we saved money while traveling was by finding free camping wherever we went. The USDA Forest Service, the National Fish & Wildlife Service, and the Bureau of Land Management are all helpful resources for finding free camping all over the United States. The bonus is that, unless otherwise stated, these places usually allow dogs! While often these places are campsites with potable water, sometimes they are just a patch of land in the middle of the woods, next to a boat launch, or up a mountain. You might end up a little more off the beaten path than you were hoping, so do your research and know what you’re getting into. It’s important to feel confident in your dog’s ability to listen and respond to you when you really need them to. In our experience, the two most important commands are come and stay. No matter where we were or what we were doing, as long as Basil listened to these two commands we were confident we could control the situation. Before traveling, it can be helpful to introduce your dog to lots of new experiences (sights, sounds, and smells) rewarded with lots of tasty treats so that they will associate good things with new places. If you are leaving for a long trip like we did, bring lots of dog food, especially if your pup has a particular diet. Make sure your dog is up to date on all shots, particularly rabies vaccine. We brought a folder with Basil’s health records in case we needed to go to a vet in another state. To obtain your dog’s records, ask your vet to print them out for you. Also, it’s helpful to be well stocked up on Heartgard (or other heartworm protection). Traveling with a dog takes some planning and thought, but it can influence the course of your trip for the better. 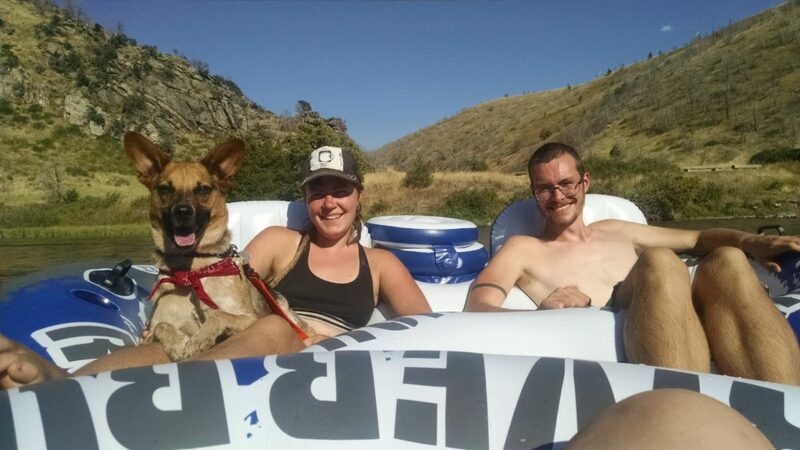 We found that having our dog with us meant we couldn’t camp everywhere or explore big parts of National and State Parks, which forced us to find less traveled places to visit. We ended up exploring where we would never have seen otherwise, such as the aquamarine Ashley Lake in Montana, a pristine river outside of the Redwoods in California, and a campsite on the edge of a lush rainforest on the Olympic Peninsula in Washington state. Having our pup with us led to adventures that we couldn’t have possibly planned for, and there’s no better way to travel than that. Thanks to Ben Kilbride for his insight, personal wisdom, and for sharing so many wonderful photos with our readers. We hope you, Hannah, and Basil have many more exciting trips in your future! Thanks to Aaron Taub, our Avondale and Irving Park walker, for his help in putting this article together. Hopefully you now have an idea of how to have a fun and safe trip with your dog! OK! Time to get that doggo acclimated to the car and go have some adventures!